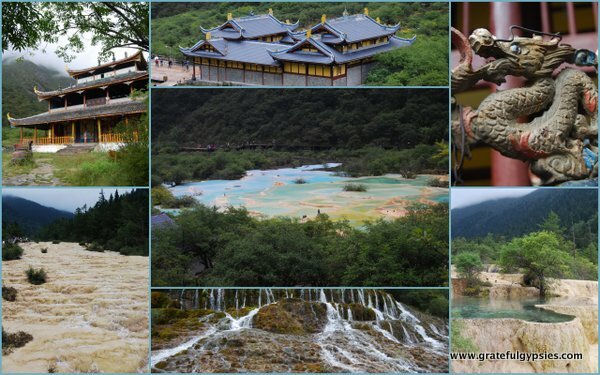 After exploring the national park at Jiuzhaigou for one day and doing an intense trek for another three, we headed out by bus to visit yet another national park – Huanglong, or the “Yellow Dragon.” It’s said that the scenic area resembles a dragon winding its way through the surrounding forest and mountains. Inside, we bought a ticket for the park and the cable car to take the easy way up. A wooden boardwalk takes visitors around a series of layered colorful ponds of different shapes and sizes, with mountains towering above in the distance and waterfalls constantly flowing. Even on a cloudy and rainy day, it was a stunningly beautiful sight. 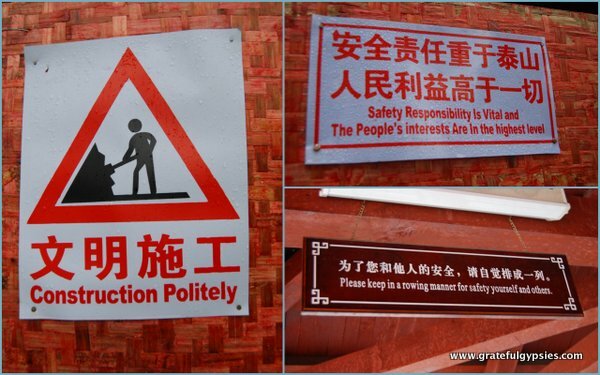 Hilarious Chinglish signs at the park. We casually strolled along the boardwalk, admiring the scenery and visiting the temple in the middle. Huanglong is much less crowded and much smaller than Jiuzhaigou, so a few hours was good enough to walk the entire length of the boardwalk from the top back to the entrance. 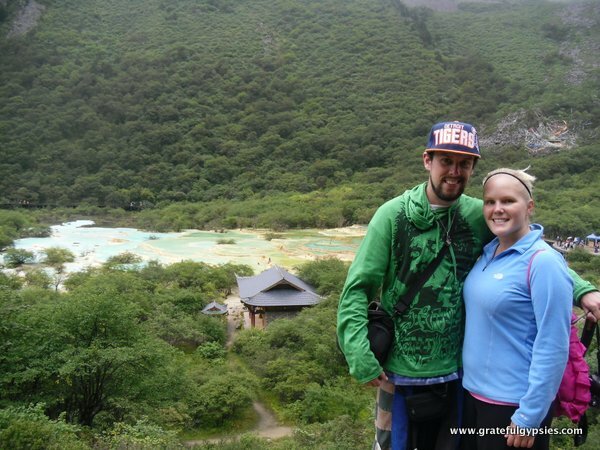 Take a video tour of Huanglong with us! Our bus took us to the small town of Chuanzhusi, where we got off and went out in search of a hotel room for the night. It didn’t take long for us to find a nice, cheap double room. We then headed out on foot to explore the small town a bit. First up, we visited the temple that the town was named after, where we rang the prayer bells and Rachel bought some Tibetan jewelry. From there, we wandered around the quiet streets, laughing at the Chinglish signs. With bellies rumbling, we stopped in a Lanzhou beef noodle restaurant, where we ordered up a feast and had a nice chat with the owner. He told us that his family ran the restaurant in Chuanzhusi in the spring and summer, but that they headed back to Lanzhou in the fall when the place basically becomes a ghost town. These random chats with business owners in China always prove to be interesting, and it’s nice to get a glimpse into the ups and downs of life for local people. At night, the streets were basically empty, so we grabbed a few street beers and headed down to the river. Sitting by the rushing water in the glow of a neon-lit bridge, we reflected on what had been an awesome travel experience in China. For as much as big city life in Beijing drives us crazy, these kinds of experiences make living here more than worth it. The town of Chuanzhusi in Sichuan province. The next day, we had a little time to wander around some more and get a good lunch before heading to the airport, which is about a 30-minute drive from the town. Staying in Chuanzhusi for the night proved to be a great idea, as we then had to spend the entire day on a plane or in the airport on our way back to Beijing. In the end, our Sichuan trip worked out perfectly, and we wouldn’t change a thing about it. Check out Chuanzhusi in this video. Enjoying the great outdoors at Huanglong Park. Transportation: You can easily get a bus from Jiuzhaigou to Huanglong for about 40 RMB. Alternatively, you can get there from the local airport. If you’re flying in and starting your Sichuan trip here, the airport is not far from Chuanzhusi. Get Around: The park isn’t too big, so you can take the cable car up and then walk back down to the entrance. In Chuanzhusi town, everything is walk able. 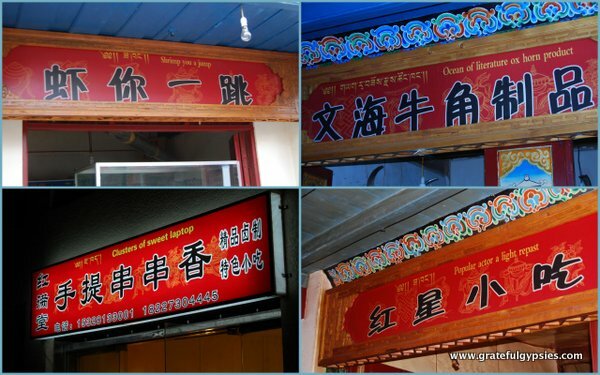 Accommodation: There are a variety of guesthouses in Chuanzhusi on the main road, so it’s easy to find a cheap room on arrival. Activities: Obviously, visiting the Huanglong scenic area is the #1 thing to do. 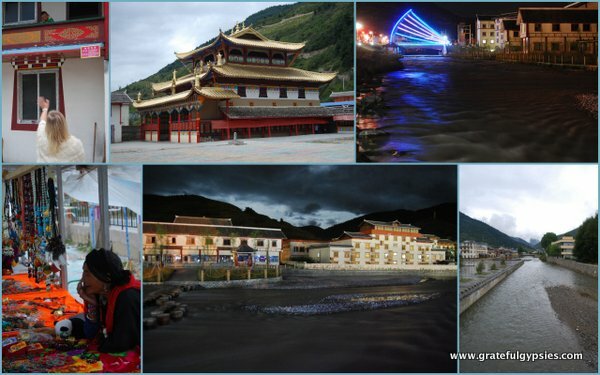 In Chuanzhusi, there is a little temple you can visit, and you can also do some shopping or just hang out by the river. Food/Drink: You’ll find a few restaurants in the town of Chuanzhusi, and there are always street beers available in the little corner stores. Recommended Time: One day is enough to see the park in the morning and hang out in Chuanzhusi before catching a flight out the next morning.